When former Oregon Ducks cornerback Ifo Ekpre-Olomu suffered a collegiate career-ending ACL injury just weeks before the postseason, Ducks fans, coaches, and teammates were heartbroken. But there was little doubt that All-American defenseman would let an injury ruin his chances to play in the NFL. Down but not out, Ekpre-Olomu continues to display the same resolve and determination that made him an unforgettable star throughout his storied career at Oregon. For weeks, Ekpre-Olomu has quietly and tirelessly worked on his post-surgery recovery at the Proactive Sports Performance in Orange County, California. Ekpre-Olomu’s intensive rehabilitation program has reignited his motivation to return as a viable NFL prospect. While closer to his family in California, Ekpre-Olomu prefers seclusion as he focuses on his recovery and maximizing benefits from his daily training regimen at Proactive. It was never clear where Oregon’s speedy and aggressive defender would end up in the 2015 NFL Draft, but some have him dropping to the third or fourth round due to his injury. This may not be as bad as it sounds, as Chip Kelly may pick up Ekpre-Olomu on the sly, satisfying the Eagles’ need for an improved defensive secondary. 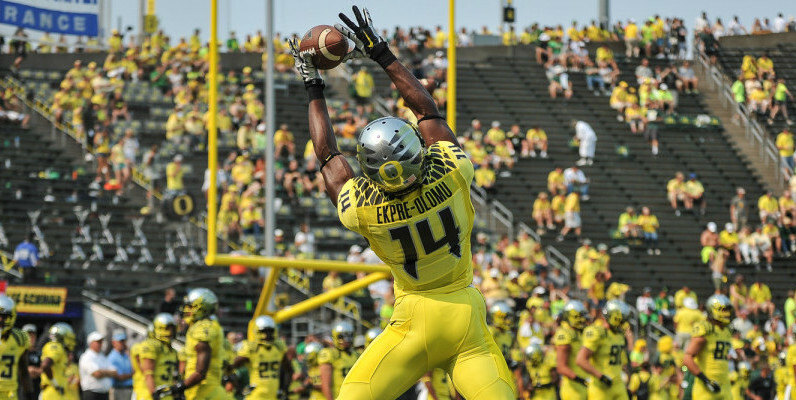 For NFL scouts, Ekpre-Olomu’s size and injury is a definite issue, but his versatility and football acumen will undoubtedly help prospective NFL teams overlook these flaws. I’m a versatile player. I was able to play nickel (back) throughout my career at Oregon. It really is going to help me in the long run because now the league really runs through the slot receiver. If you can have a guy that can cover the slot receiver, and try to shut him down, it just helps the team. Ekpre-Olomu knows he will have to put in more work than other players to achieve his NFL dreams. The road to recovery requires putting one foot in front of the other. Step by step, the talented young cornerback appears to be moving in the right direction.